Puya Raimondi, also known as Queen of the Andes, is an endemic species of the alto-andina zone of Bolivia and Peru. 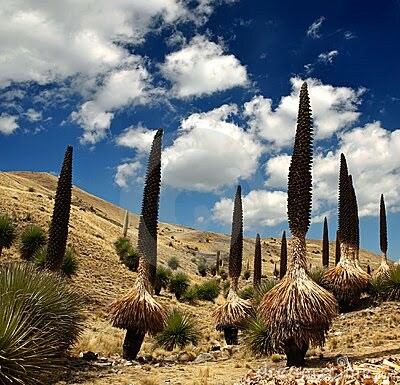 This plant lives in isolated areas with stone soils and an altitude of 3200 – 4800 m. Puya raimondii has a 10 meters inflorescence with more than three thousand flowers and produces 8–12 million seeds in each plant, but it only blooms once in its lifecycle. It can live about 100 years. The species is officially considered endangered.